Cottage Elements: What's that I Here? Another JUNKMARKET Giveaway?? What's that I Here? Another JUNKMARKET Giveaway?? That's right, you heard me right. 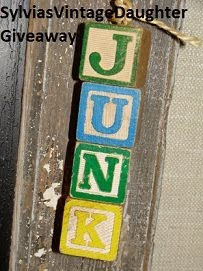 It's another JUNKMARKET Giveaway! So if you missed out on the first giveaway, you've got another chance. Woo hoo! If you haven't been to Kathy's blog, you really need to check it out. She's a fellow Contributor on JMS, and we want to encourage you all to become members on the amazing JMS website. So thus, another giveaway! And along with her giveaway, she is once again putting Sue Whitney of JMS to the test. She's got some really tough questions for her; but alas, she can't stump Sue. Sue's got some dynamite answers! But what is Kathy giving away? Not just the three things I offered, but she's added some extra goodies to the mix. Well how cool is that? So don't just sit there. Jump on over to her blog by clicking on the blogger button on the side of this blog or the picture at the top, and good luck! Thanks so much for sharing my giveaway (and for your blogger button assistance!!)! Looking forward to lots of new members at JMS & and a fun giveaway!